Want to catch up on the latest developments ideas, and best practices in Cucumberworld? Want to hear from the creator of Cucumber Aslak Hellesøy? 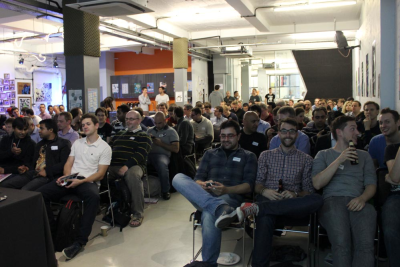 We are proud to present the third annual CukeUp!, held at Skills Matter London. Under Cucumber creator Aslak Hellesøy's expert guidance, we present a fast-paced day packed with 30-minute talks on everything Cucumber. If you'd like to join us and 100+ other developers passionate about Cucumber, BDD, TDD and more you can find more information about Cukeup 2014 on the #Cukeup webpage. Cucumber is 5 years old and has grown into a big ecosystem. In this keynote Aslak shares his vision for the future! Expect to see real-world scenarios from a trading system, and hear how they were produced through collaboration between Business Analysts and Developers.You will also see how the examples were automated using the Tickspec library which includes a number of novel extensions to the Gherkin language"
You'll learn the pitfalls to avoid, and the tricks and general principles to keep your Cucumber test suites easy to maintain for the long game. With the number of your Cucumber tests increasing you need more and more time to find a step definition usages or look up where they are placed in your code. In this talk Andrey shows how tools save time while working with Cucumber and how code analysis routine works in JetBrains products. Andrey Vokin is a Java developer at JetBrains. He has master degree in computer science. Andrey is responsible for integration of Cucumber and CoffeeScript in IDEs from JetBrains. At the centre of Cucumber's implementation is the `world` construct. In this talk Andrew explores this structure, and in particular the naming of it. Andrew shows how thinking about writing Cucumber features and step definitions is about creating a world that can help produce a set of step definitions that makes working with Cucumber simpler and more productive. In this presentation Marcus introduces ways to do doing Specification by example on the .NET platform by recreating a demonstration from the Cucumber book. Ever since he first heard about Cucumber he always felt that those Ruby-folks has a nicer set-up around Cucumber and it's tools . This talk is a veritable OSS-fest with SpecFlow, Nancy and Pickles. Marcus Hammarberg is a consultant and contractor working in Stockholm, Sweden. He was bitten by the BDD/Specification by example bug about four years ago, first reading the famous Dan North introduction. Many companies are developing for multiple platforms: Android phone and tablet, iPhone, iPad, and (responsive) Web. In many cases, the business requirements and specifications are the same, or very similar across platforms. This leads naturally to questions like: how can we ensure quality and consistency across platforms? how can we minimize cost of quality assurance and automated testing? BDD provides a good framework for providing answers to such questions. This talk will demo an approach to cross-platform BDD using Cucumber and Calabash. We will focus on reusing more than just features across platforms! We'll also touch upon topics such as end-to-end testing and monitoring. Finally, this talk will also provide an overview of Calabash: which brings Cucumber to Mobile native and hybrid apps. This can be achieved by using the web services exposed by the application under test to create the data and the pattern to abstract the complexities of interacting with the web services for creating data. Writing cukes describing the real business value a feature is providing is hard. We end up having an horrendous amount of step definitions that muddle the real value the feature is providing; cluttered with interactions with the UI. This talk describes a different approach to writing cukes following a pattern that has evolved from working on several customer project; The Impersonator Pattern. With this approach to defining your step definitions you will have clearer steps in your cukes. You will be able to see in "one go" what a certain type of user can do in the application you are describing and benefit from the clarity of the cukes. Why did we choose Cucumber? What difficulties have we been facing with and how did we solve them? Meet several examples with some interesting details on how we use Cucumber tests in IntelliJ-based products. This talk is about the practical testing experience with Cucumber in JetBrains IntelliJ IDEA and RubyMine projects. Kirill Likhodedov is a senior Java developer at JetBrains. He has a master degree in computer science. For the last 3 years he has been developing and supporting Git integration and Diff/Merge subsystems in IntelliJ-based products. This session covers how developers can utilise Cucumber.js to test a realtime-web application, drawing on the experiences and lessons learnt in testing Dashku.com. Paul shares tools and tips with the audience, shedding light on how they can bring the wonderful world of Cucumber to the realtime-web. Paul is a developer at Axisto Media. He previously worked at New Bamboo and AOL, and is a core contributor to the SocketStream web framework. Following the behavior driven development (BDD) methodology thoroughly, one would expect 100% code coverage, since code is only written to make the tests pass. Based on this assumption Melanie and Mathias have investigated BDD-driven projects and found out that this is not the case. As a consequence, they propose a feature to Cucumber that generates new scenarios based on uncovered code. Applying this feature continuously eventually results in fully covered implementation. A ParkBench Panel discussion, to discuss ideas, stuff learnt during the morning and stuff you may like to hear more about. Participants were actively encouraged to join the panel to express their opinion and share experiences! At the centre of Cucumber's implementation is the world construct. In this talk Andrew explores this structure, and in particular the naming of it.